Vesicles are responsible for transporting molecules between the different compartments within a cell and also for bringing material into cells from outside. There are several types of vesicle: each has a specific type of coat which is made up of different proteins and assembles onto a membrane surrounding the vesicle. The EMBL team has been taking a close look at a coat called COPI. This surrounds vesicles that move material around within the Golgi apparatus and to the endoplasmic reticulum (ER) - these are regions of the cell where proteins are made and modified in preparation for transport to the cell surface. Using a technique called cryo-electron tomography, in which samples can be frozen at very low temperatures to avoid fixing or staining them chemically, the researchers combined data from hundreds of vesicles to build up a 3D image of the COPI coat. This enabled them to produce the most detailed pictures yet obtained of a vesicle coat assembled on the vesicle membrane. This imaging technique is still in its infancy and although scientists have been able to gather structural information about parts of the membrane coats in other types of vesicle, this is the first time a model of a complete assembled vesicle coat has been produced. What the images revealed was surprising: unlike other types of vesicle, where the coat is thought to be made from proteins assembled in different layers - each with a specific function - around the vesicle membrane, the EMBL team observed that the proteins in the COPI coat all intertwine together in one big layer, which is curved to fit around the membrane. More precisely, the COPI coat is made of a repetition of building blocks, called "triads", that contain all the important functional elements organised in a precise 3D structure. "Until now we could see different elements of the vesicle coat, but not get a complete and detailed picture of the coat assembled onto the vesicle membrane. This is an important step forward for our understanding of intracellular transportation," explains John Briggs who led the study. 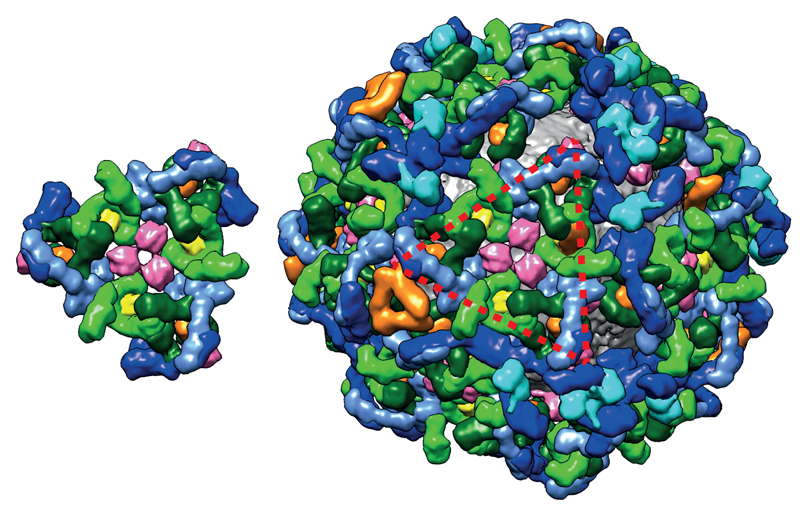 "Our images showed us how the proteins that make up the coat are arranged and it was surprising to discover how different COPI is from, for example, clathrin or COPII coated vesicles," adds Svetlana Dodonova, co-author of the paper. "Our next step will be to try to find out how this coat forms and binds to the vesicle membrane and how it arranges itself into such complex shapes."